An interesting game for Filipino SM Beermen (13-2) which played road game in Hong Kong against second-best Hong Kong Hong Kong ELL (11-9). First ranked SM Beermen had an easy win 96-81. It ended at the same time the two-game winning streak of Hong Kong ELL. SM Beermen dominated down low during the game scoring 64 of its points in the paint compared to Hong Kong ELL's 32. SM Beermen had a 31-19 advantage in offensive rebounds. They looked well-organized offensively handing out 27 assists. It was a good game for American-Puerto Rican forward Renaldo Balkman (203-84, college: S.Carolina) who led his team to a victory with 32 points and 4 assists. American-Puerto Rican center Peter Ramos (222-85) contributed with 11 points, 14 rebounds and 9 assists for the winners. Maltese center Samuel Deguara (223-91) replied with a double-double by scoring 20 points and 16 rebounds for Hong Kong ELL. Hong Kong ELL's coach rotated ten players which allowed the starters a little rest for the next games. SM Beermen have an impressive five-game winning streak. They maintain first position with 13-2 record. Hong Kong ELL at the other side keeps the second place with nine games lost. SM Beermen are looking forward to face bottom-ranked Zhuhai (#10) in the next round and are hoping to win another game. Hong Kong ELL will play again against the league's leader SM Beermen (#1) and it may be a tough game between close rivals. The game in Kuala Lumpur was also worth to mention about. Seventh ranked Chinese Macau (8-7) played at the court of 8th ranked Malaysian Westports MD (5-9). Macau defeated Westports MD 97-86. American-Filipino guard Mikh McKinney (184-92, college: Sacramento St.) scored 35 points (!!! ), 9 rebounds and 6 assists to lead the charge for the winners and Ryan Watkins chipped in 26 points and 15 rebounds during the contest. The best for the losing side was American forward Chris Eversley (201-91, college: Cal Poly - SLO) with a double-double by scoring 28 points, 16 rebounds and 4 assists. Macau maintains seventh position with 8-7 record. Westports MD lost fifth consecutive game. They keep the eighth place with nine games lost. Macau will have a break next round, and it should allow them to practice more before next game. Westports MD will play against Formosa D. (#3) in Changhua City and hopes to get back on the winning track. The game in Singapore was also quite interesting. One of their biggest challengers Vietnamese Saigon Heat (10-8) played at the court of fifth ranked Singapore Singapore Slingers (10-7). Singapore Slingers managed to secure a 6-point victory 76-70 on Sunday. John Fields notched a double-double by scoring 16 points and 15 rebounds to lead the effort. Even 20 points, 8 rebounds, 7 assists and 4 steals by TreVon Hughes did not help to save the game for Saigon Heat. Singapore Slingers moved-up to fourth place. 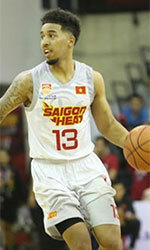 Saigon Heat lost fourth consecutive game. They dropped to the fifth position with eight games lost. Singapore Slingers will have a break next round, and it should allow them to practice more before next game. Saigon Heat will play against Formosa D. (#3) in Changhua City and it may be a tough game between close rivals. A very interesting game took place in Bangkok. It ended with only three-point defeat on the road of higher ranked Singapore Singapore Slingers (10-7) to ninth ranked Thailand Mono Vampire (5-12) 87-84 on Wednesday evening. The best player for the winners was Michael Singletary who scored 25 points, 7 rebounds and 6 assists (went 7 for 7 at the free throw line). Mono Vampire have a solid three-game winning streak. They maintain ninth position with 5-12 record. Singapore Slingers at the other side dropped to the fourth place with seven games lost. Mono Vampire's next round opponent will be higher ranked CLS Knights (#6) in Surabaya and it may be quite challenging game. Worth to mention about the upset in a game between Indonesian CLS Knights (9-9) and Thailand Mono Vampire (5-12), which took place in Bangkok. 6th ranked CLS Knights lost to ninth ranked Mono Vampire in a road game 76-92 on Saturday. It was a good game for Michael Singletary who led his team to a victory with a double-double by scoring 29 points, 15 rebounds and 9 assists. Both coaches used bench players and allowed the starting five to rest. Mono Vampire have a solid three-game winning streak. They maintain ninth position with 5-12 record. Loser CLS Knights keep the sixth place with nine games lost. Mono Vampire will face again higher ranked CLS Knights (#6) in Surabaya in the next round and it may be quite challenging game. A very interesting game took place in Bangkok. It ended with only three-point defeat on the road of higher ranked Singapore Singapore Slingers (10-7) to ninth ranked Thailand Mono Vampire (5-12) 87-84 on Wednesday evening. Mono Vampire players were unselfish on offense dishing 33 assists comparing to just 16 passes made by Singapore Slingers' players. The best player for the winners was American forward Michael Singletary (198-88, college: Texas Tech) who scored 25 points, 7 rebounds and 6 assists (went 7 for 7 at the free throw line). American-FYR Macedonian Romeo Travis (198-84, college: Akron) chipped in a double-double by scoring 19 points, 13 rebounds and 5 assists. Singletary is a former Eurobasket Summer League player, which is considered top international summer league in the market. Four Mono Vampire players scored in double figures. At the other side the best for losing team was American power forward John Fields (205-88, college: Tennessee) who recorded a double-double by scoring 26 points, 16 rebounds and 4 assists and his fellow American import guard Xavier Alexander (198-88, college: S.Nazarene) added 29 points, 10 rebounds and 4 assists respectively. Mono Vampire have a solid three-game winning streak. They maintain ninth position with 5-12 record. Singapore Slingers at the other side dropped to the fourth place with seven games lost. Mono Vampire's next round opponent will be higher ranked CLS Knights (#6) in Surabaya and it may be quite challenging game. An interesting game for Filipino SM Beermen (13-2) which played road game in Hong Kong against second-best Hong Kong Hong Kong ELL (11-9). First ranked SM Beermen had an easy win 96-81. It ended at the same time the two-game winning streak of Hong Kong ELL. SM Beermen dominated down low during the game scoring 64 of its points in the paint compared to Hong Kong ELL's 32. SM Beermen had a 31-19 advantage in offensive rebounds. They looked well-organized offensively handing out 27 assists. It was a good game for American-Puerto Rican forward Renaldo Balkman (203-84, college: S.Carolina) who led his team to a victory with 32 points and 4 assists. American-Puerto Rican center Peter Ramos (222-85) contributed with a double-double by scoring 11 points, 14 rebounds and 9 assists for the winners. Maltese center Samuel Deguara (223-91) replied with a double-double by scoring 20 points and 16 rebounds and American-Dominican guard ODarien Bassett (189-86, college: Troy) added 24 points and 7 rebounds in the effort for Hong Kong ELL. Hong Kong ELL's coach rotated ten players which allowed the starters a little rest for the next games. SM Beermen have an impressive five-game winning streak. They maintain first position with 13-2 record. Hong Kong ELL at the other side keeps the second place with nine games lost. SM Beermen are looking forward to face bottom-ranked Zhuhai (#10) in the next round and are hoping to win another game. Hong Kong ELL will play again against the league's leader SM Beermen (#1) and it may be a tough game between close rivals. Worth to mention about the upset in a game between Indonesian CLS Knights (9-9) and Thailand Mono Vampire (5-12), which took place in Bangkok. 6th ranked CLS Knights lost to ninth ranked Mono Vampire in a road game 76-92 on Saturday. Mono Vampire outrebounded CLS Knights 46-32 including a 34-22 advantage in defensive rebounds. They looked well-organized offensively handing out 29 assists. It was a good game for American forward Michael Singletary (198-88, college: Texas Tech) who led his team to a victory with a double-double by scoring 29 points, 15 rebounds and 9 assists. 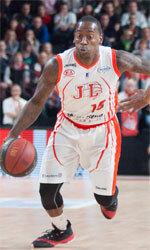 American-FYR Macedonian Romeo Travis (198-84, college: Akron) contributed with 13 points and 9 rebounds for the winners. Singletary is a former Eurobasket Summer League player, which is considered top international summer league in the market. Four Mono Vampire players scored in double figures. American guard Doug Herring-Jr (191-87, college: Utica) replied with a double-double by scoring 17 points, 6 rebounds and 10 assists and American-Nigerian power forward Maxie Esho (206-91, college: Massachusetts, agency: Two Points) added 21 points and 9 rebounds in the effort for CLS Knights. Both coaches used bench players and allowed the starting five to rest. Mono Vampire have a solid three-game winning streak. They maintain ninth position with 5-12 record. Loser CLS Knights keep the sixth place with nine games lost. Mono Vampire will face again higher ranked CLS Knights (#6) in Surabaya in the next round and it may be quite challenging game. The game in Kuala Lumpur was also worth to mention about. Seventh ranked Chinese Macau (8-7) played at the court of 8th ranked Malaysian Westports MD (5-9). Macau defeated Westports MD 97-86. American-Filipino guard Mikh McKinney (184-92, college: Sacramento St.) scored 35 points (!!! ), 9 rebounds and 6 assists to lead the charge for the winners and American power forward Ryan Watkins (206-91, college: Boise St., agency: Two Points) chipped in 26 points and 15 rebounds during the contest. The best for the losing side was American forward Chris Eversley (201-91, college: Cal Poly - SLO) with a double-double by scoring 28 points, 16 rebounds and 4 assists and his fellow American import Winston Shepard (203-93, college: San Diego St., agency: Slash Sports) produced a double-double by scoring 24 points, 15 rebounds and 4 assists. Both teams had four players each who scored in double figures. Macau maintains seventh position with 8-7 record. Westports MD lost fifth consecutive game. They keep the eighth place with nine games lost. Macau will have a break next round, and it should allow them to practice more before next game. Westports MD will play against Formosa D. (#3) in Changhua City and hopes to get back on the winning track. The game in Singapore was also quite interesting. One of their biggest challengers Vietnamese Saigon Heat (10-8) played at the court of fifth ranked Singapore Singapore Slingers (10-7). Singapore Slingers managed to secure a 6-point victory 76-70 on Sunday. Singapore Slingers outrebounded Saigon Heat 50-38 including 36 on the defensive glass. Great defensive blocking was one of the keys in this match when Singapore Slingers made 7 blocks. American power forward John Fields (205-88, college: Tennessee) notched a double-double by scoring 16 points and 15 rebounds to lead the effort and the other American import guard Jerran Young (198-91, college: Wright St.) supported him with 21 points and 10 rebounds. Four Singapore Slingers players scored in double figures. Even 20 points, 8 rebounds, 7 assists and 4 steals by American-Puerto Rican point guard TreVon Hughes (185-87, college: Wisconsin) did not help to save the game for Saigon Heat. American forward Chris Dierker (196, college: Madonna) added 16 points and 7 rebounds. Singapore Slingers moved-up to fourth place. Saigon Heat lost fourth consecutive game. They dropped to the fifth position with eight games lost. Singapore Slingers will have a break next round, and it should allow them to practice more before next game. Saigon Heat will play against Formosa D. (#3) in Changhua City and it may be a tough game between close rivals.